After turning down a contract with the Minnesota Vikings NFL side, Dan Lyle took up rugby to keep fit. International recognition followed soon after, his Eagles debut coming in a 26-15 loss to Ireland at Lansdowne Road while he was representing Old Mission Beach Athletic Club. 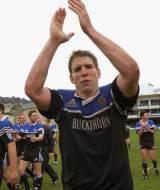 In 1996 he joined Bath, helping them to the Heineken Cup in 1998. A quick, powerful No.8, Lyle was rightly regarded as one of the finest No.8s in world rugby despite his lack of success at international level. After leaving Bath he enjoyed a spell with Leicester Tigers, eventually retiring from the game following the 2003 Rugby World Cup. He became heavily involved in US rugby as tournament director of the USA Sevens.